Super Savings Item! 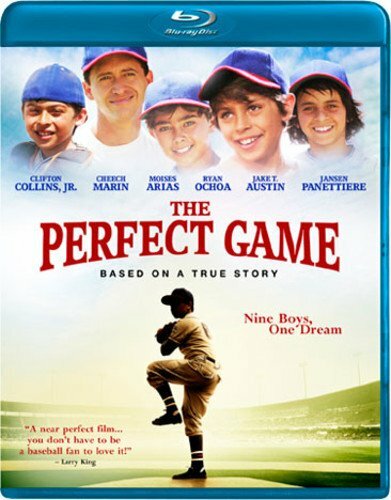 Save 39% on the The Perfect Game [Blu-ray] by Word Entertainment at Chocolate Movie. MPN: 886956. Hurry! Limited time offer. Offer valid only while supplies last. From the director of Angels in the Outfield comes the incredible true story of the underdog foreign Little League team who inspired two nations. From the director of Angels in the Outfield comes the incredible true story of the underdog foreign Little League team who inspired two nations. Clifton Collins Jr. (Star Trek) heads an all-star line-up of some of Hollywood’s brightest young stars as Cesar, who returns to his native Monterey, Mexico after his major league career is cut short. Moises Arias (Hannah Montana), Jake T. Austin (Wizards of Waverly Place) and Ryan Ochoa (iCarly) costar as impoverished baseball-loving kids who recruit him to coach their rag-tag team. Together, they beat the odds and overcome hardships and bigotry to compete in the 1957 Little League World Series. Screen favorites Cheech Marin (Spy Kids), Lou Gossett Jr. (Iron Eagle), Bruce McGill (Animal House), Emilie de Ravin (Lost) and David Koechner (Anchorman) are featured in this uplifting story in the winning tradition of Hoosiers that Boxoffice magazine cheered as "inspiring, richly entertaining, heartfelt…a perfect family movie." View More In Faith & Spirituality. If you have any questions about this product by Word Entertainment, contact us by completing and submitting the form below. If you are looking for a specif part number, please include it with your message.